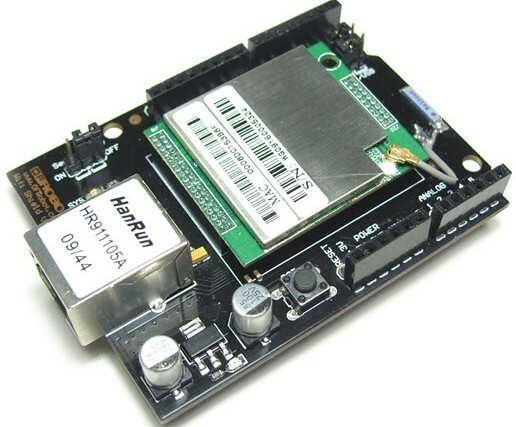 This is an easy to use and powerful wifi shield for Arduino. It converts standard serial data to TCP stack. However, before making it work, you need to configure the wifi as standard wifi device. Please take a look at the manual of how to set it up. The easiest way to set it up is using standard Ethernet cable. 3_ Open a web browser on your PC and input “192.168.1.254”, the default IP address of WIZ610wi. 5_ And you can follow the instruction on the manual from page 35. 6_ You need to set the wifi shield to Client Mode. In this mode, your device act as a client. If you configure PC or application device as DHCP client, Access Point will be the DCHP Server and WIZ610wi doesn’t act as DHCP Server. 7_ Input all information that needed to connect to your wireless router such as SSID, password, etc. 8_ Then configure your serial setting. Please refer page 37 of the manual. The configuration depends on your application. 9_ Restart the wifi shield. And your arduino code can send or receive data as a serial port. The wifi shield draws more current than a USB can supply. Supply the Arduino with external power which has at least 1A current.